In order to increase efficiency across the board, be productive wherever you are, simplify IT management, find user-friendly solutions, and stimulate employee motivation, it has become necessary for businesses to change with the changing times. One of the areas where change has been necessary is in communication. Today’s business communication tools are enabling small, medium-sized, and large companies to achieve all of the above and even more. How can business communication managers determine the right tools to use for internal communication? What are some of the internal business communication problems that need to be addressed ... and what tools can they use to solve some of these problems? Here are 5 business communication tools that you can get started with today. 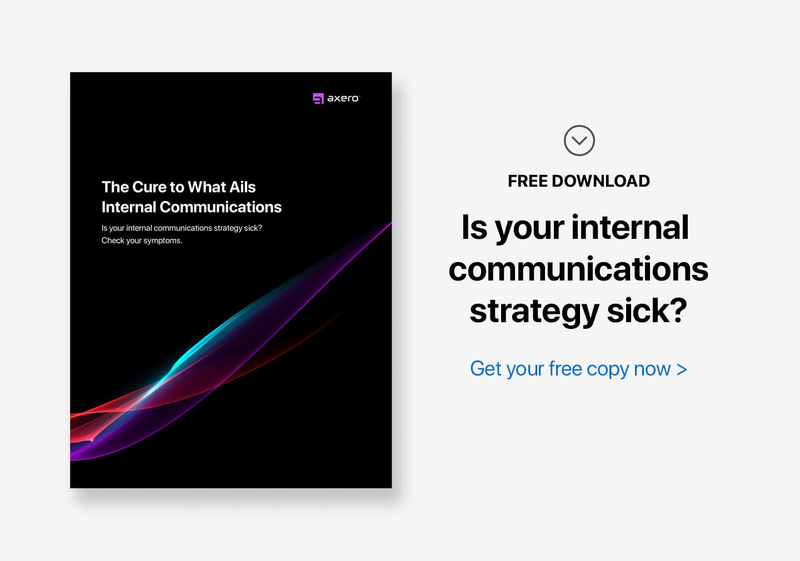 Each organization goes through a phase or transition where it becomes clear its internal communications are failing. Too often with your IT department, the approach is to press forward with technology without asking why it’s being done. However, by looking out for a few symptoms within your organization, you can have a pretty good idea what you need to do. Having a central portal where everybody can access all the relevant information, communications, documents, and contracts in one place. Social intranet software not only makes this possible, but saves your business money by lowering IT maintenance costs. In this age of BYOD and telecommuting, an intranet solution makes for a more flexible workforce ... which ups productivity by ensuring all employees are working towards the same goals. 2. Private, group messaging, and chat tools. Project teams and groups need collaboration tools to help them be more effective in the workplace. Without a platform or designated spaces where they can collaborate, it becomes difficult to keep tabs on their progress. Being able to bring your teams together also helps them be more effective and provides an easy way of reporting progress. Collaborative spaces with private, group messaging, and chat capabilities provide the perfect business communication tools to keep teams working together. Such spaces are important when business communication managers need updates on the progress of projects or when they need to communicate with team members. This is especially important when employees are spread across geographical locations in different time zones. While public spaces like Facebook Groups may work, dedicated intranet chat services ensure everyone is just a tap away. They can also be used to share files (with a drag and drop function) and to search for a contact or conversation in order to refer to something from the past. 3. Cases, issue tracking, and ticketing software. Today’s customer wants the ability to connect with you across a variety of channels. The problem is that there are no tools that offer a 360-degree approach to customer support and service. Customer queries are generally lost, call volumes go up, and the inability to assign the right employees to handle customer queries leaves many customers frustrated. Issue tracking software is one of the best internal communications tools that enables your customers or employees to submit a case or ticket, get it assigned to the right employee, and have it resolved on time. Issue tracking software helps centralize customer support queries, track open issues, track team productivity, prioritize the most important questions, and collect valuable customer feedback that helps improve your products and services. 4. Internal blogs and videos. The common saying is “people eat with their eyes.” When your content looks good, people will want to read it. Great content will be the defining factor as to whether your internal teams will be engaged or not. If you have low engagement from employees, little or no feedback, and an increasing ratio of lurkers to active participants, the type of content you post is likely the problem. The brain processes visual information 60,000 times faster than text. It’s therefore a no brainer that when you start to use images and videos across your digital workplace, you are going to get more traction and engagement from your employees. Infographics are another way to increase engagement. Creating training videos, videos messages from top-level managers, behind-the-scenes footage, and then posting them across the company intranet is likely to increase engagement and retention among employees. Infographics are especially suited for marketing departments and for demonstrating and explaining processes. They are visually appealing and help communicate instructions quickly and easily. Information sharing in the workplace is as vital as learning new skills. Veteran workers can orient new employees on what’s what within an organization, helping them get up to speed quickly and with fewer mistakes along the way. At the same time, a digital workspace where employees can ask questions, discuss projects and workplace issues helps bond everybody within the organization. A discussion forum that brings together everybody, management and employees, and allows for an open discussion on any topic. Such a space will help in knowledge dissemination and bring everybody closer together. Discussion forums are also great for archiving organizational knowledge that may not be easily disseminated on blogs but exists among individual employees. Social Intranet is the best way to communicate effectively in company for better communication. Thank you for sharing this insightful information. All of these tools are very helpful when it comes to establishing better business communications, especially having an intranet within the company. This is a great source of information for companies who are looking to use different technological tools to improve business communication. These tools and solutions seem easy to use and user friendly; which is especially important because there are still people in the work force who are not very computer savvy. There are still a lot of employees out there who only understand/use web 1.0; I believe these tools would be very beneficial in helping the 1.0 users become 2.0 users.